He gazes down on the marble floor. One minute. Two minutes. Three minutes. Eleven minutes. He is immobile. Pilgrims walk around him. A few pat him. One child playfully pulls his tail. One takes his photo with a mobile phone camera. But he remains stock-still. A statue. 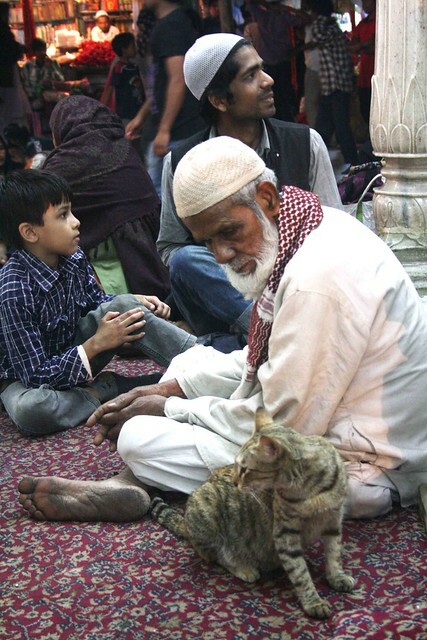 The Delhi Walla met Billi in the shrine of Hazrat Nizmauddin Auliya, Delhi’s 14th century Sufi saint. 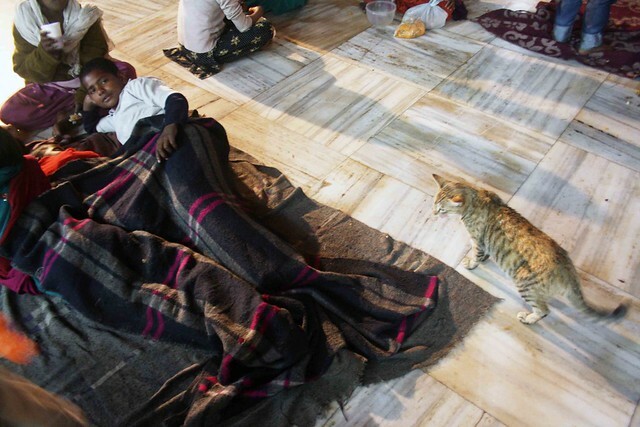 His name means ‘cat’ in Hindi. Most people call him Billi. But sometimes he is also called ‘Cat’ and ‘Catty’. His light-brown furry body is marked with black stripes. He has eight whiskers. The inside flaps of his ears have the pale red shade of raw meat. 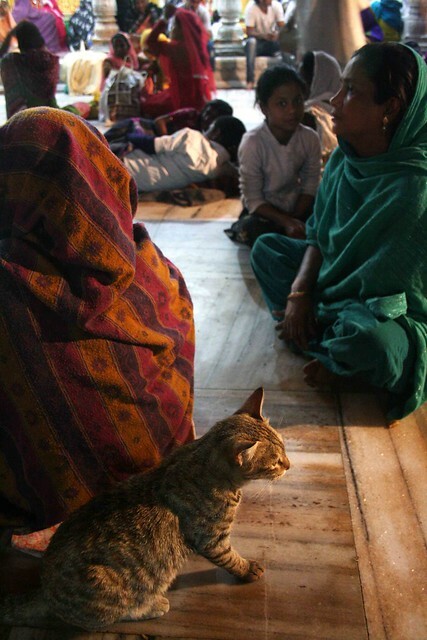 Unlike the other cats, Billi is not shy of people. He never runs away from them; he never tries to look for a secluded spot. 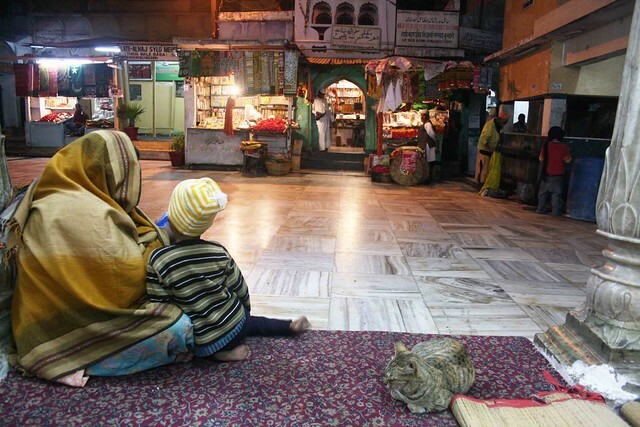 He is mostly seen sitting beside worshippers who are either praying or reading from the Quran. 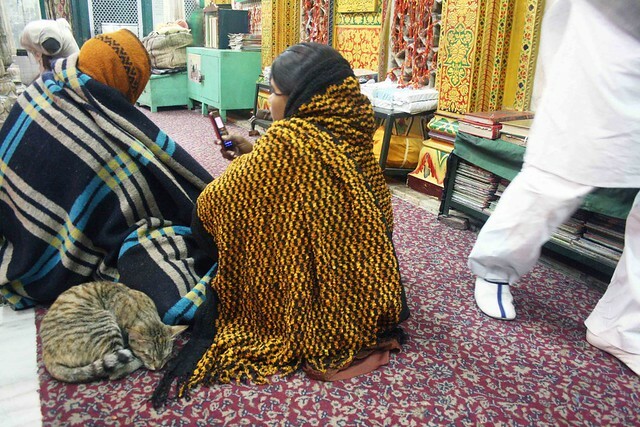 In winter, Billi often jumps into people’s laps and snuggles inside their shawls. In summer, Billi lies in the shade. 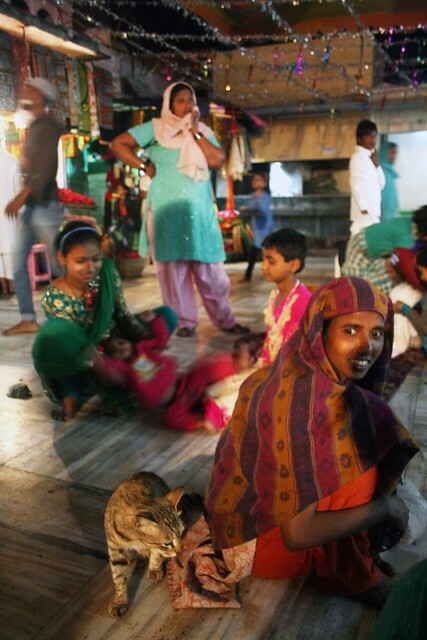 No extrovert, Billi barely looks at the crowd, and seldom seems to react to the noise and chaos so typical of pilgrim destinations. He is like an ascetic; disdainful of the corporeal world. When he is hungry, he sits beside anybody who happens to be eating. 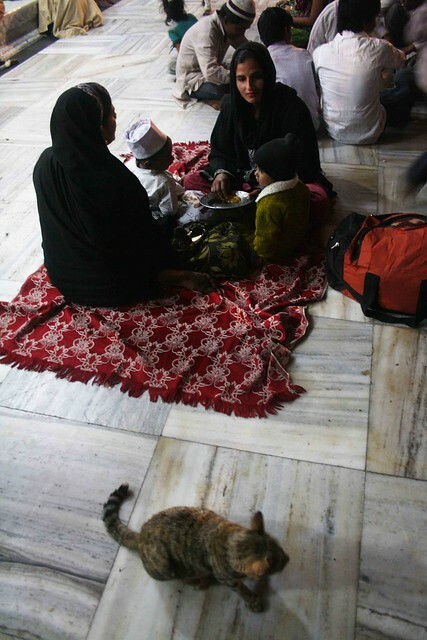 In Hazrat Nizmauddin dargah, like most other sufi shrines, pilgrims often eat, pray and sleep in the courtyard. Free food is served twice daily. Some pilgrims bring their own home-cooked meals. 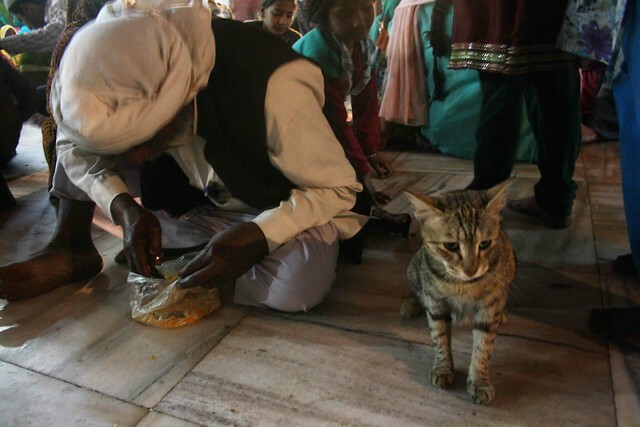 On noticing Billi, most people give a small portion of their roti or biryani to him. Some do it out of love, others out of duty. 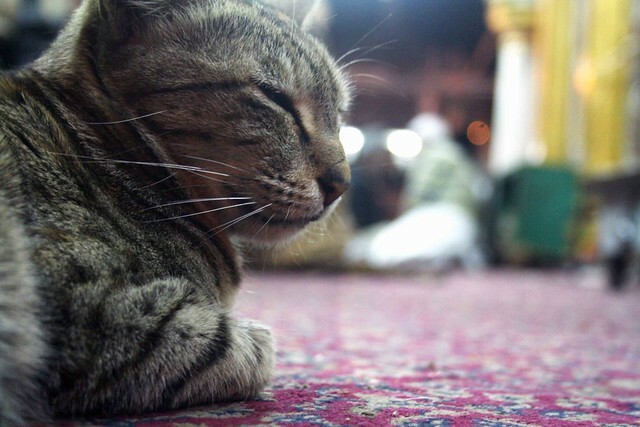 Unlike dogs, cats are traditionally considered holy in Islam. 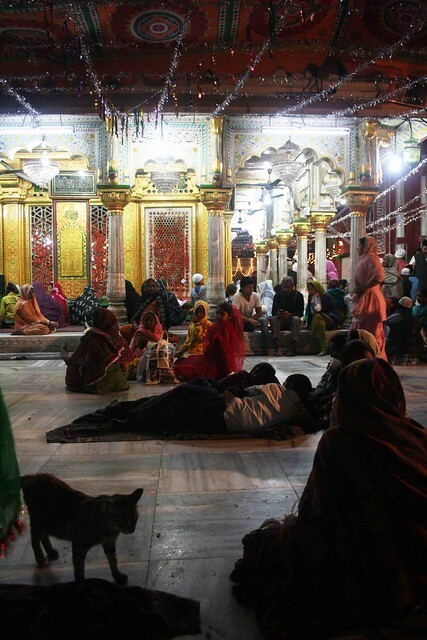 They are permitted to roam freely in shrines and mosques. 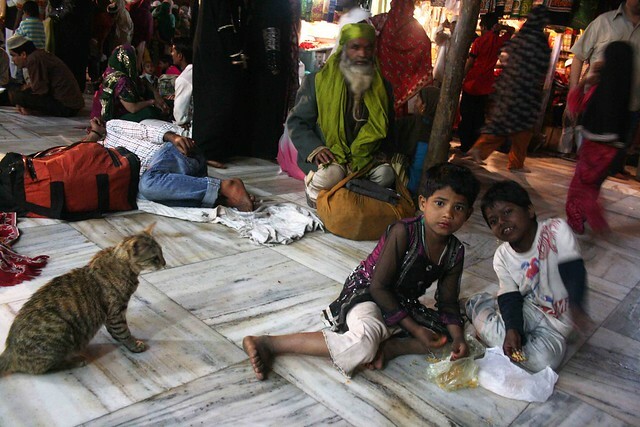 For instance, it is rare to spot dogs in the Muslim quarters of Shahjahanabad but cats lurk everywhere: in alleys, across drains, inside bakeries, on rooftops, around electric poles, alongside butcheries. 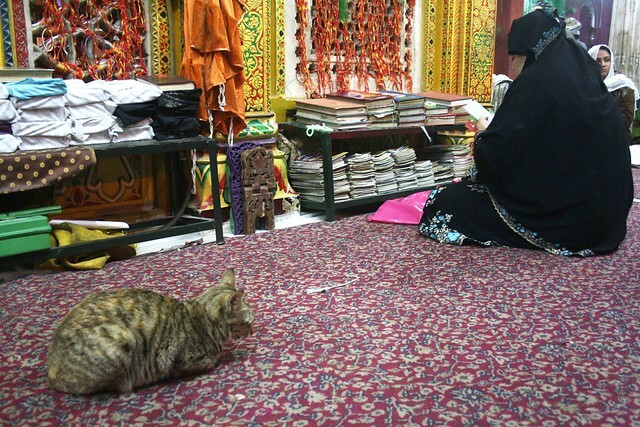 Felines owe this exalted status to Muezza, the adored pet of the Prophet Mohammed. 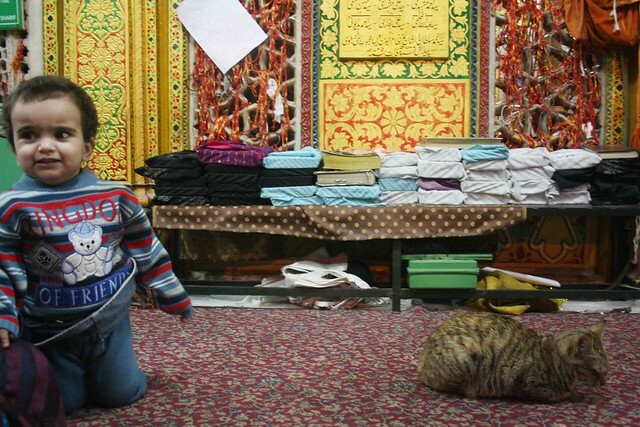 One day, as his faithful pet slept on one of the sleeves of his robe, Mohammed was called away to his prayer. Rather than disturb the cat, he cut off his sleeve. 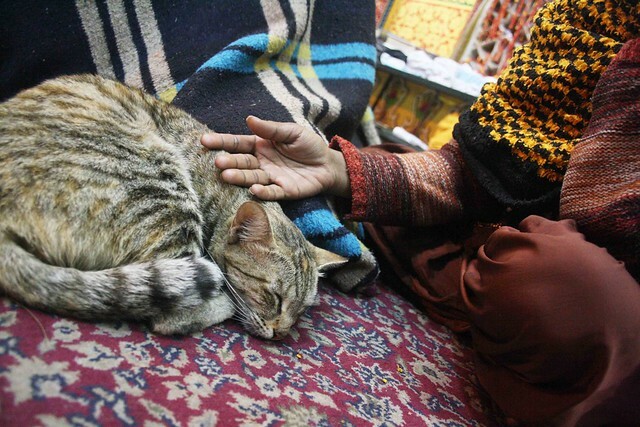 When he returned, Muezza bowed to her master and received three strokes down her back in return. This blessing assured her a spot in the afterlife. 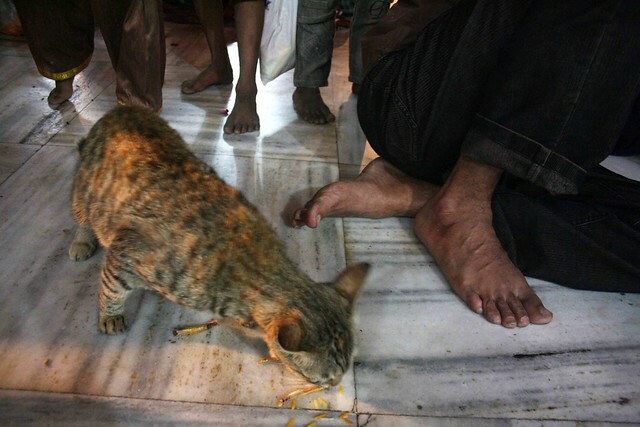 This blessing also gave a home to Billi in one of Delhi’s most exalted places. The evening prayer has just ended. The qawwals have taken out their harmonium. 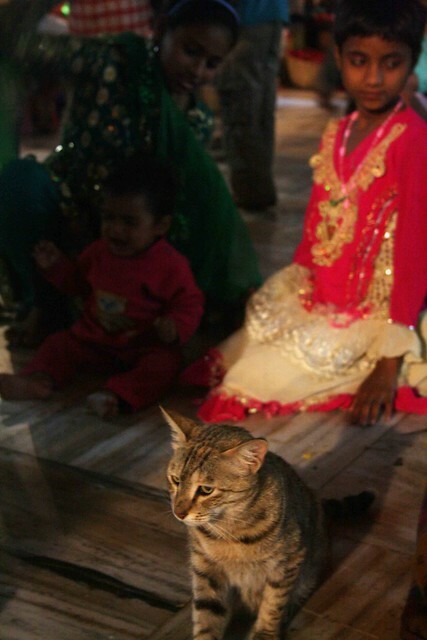 Suddenly springing to life, Billi is getting up from the marble platform, jumping down to the courtyard and making his way through the crowd. 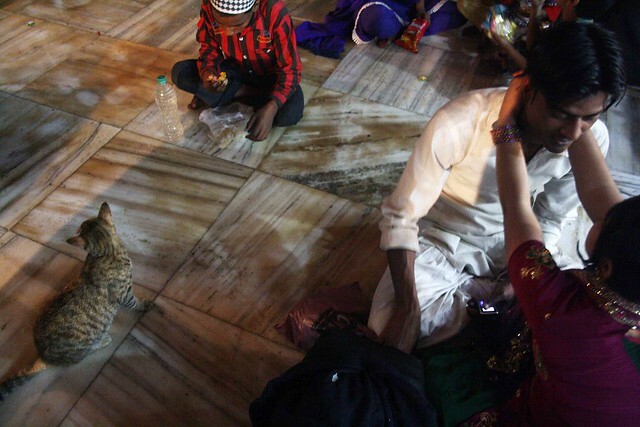 He brushes past an embracing couple. He stops by a fakeer eating biryani from a polythene bag. He briefly sits beside a circle of boys who toss chicken bones at him. He is heading towards the Jamat Khana mosque, which was built in the dargah by one of the sons of Sultan Allaudin Khilji. 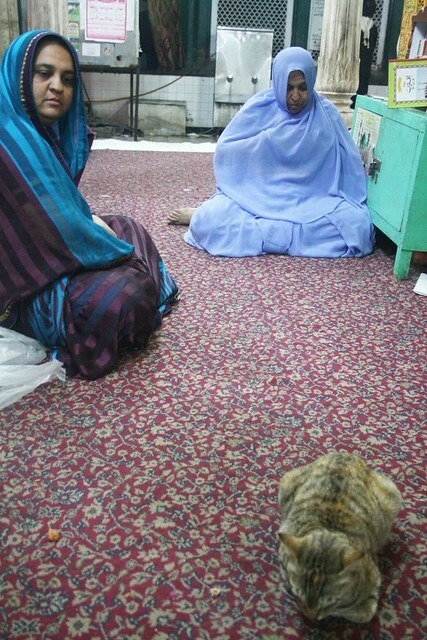 Two children try patting him but he ignores them, and enters the mosque, where he keeps walking… in the direction of Mecca. What? He doesn’t like the singing? cute! I love cats! 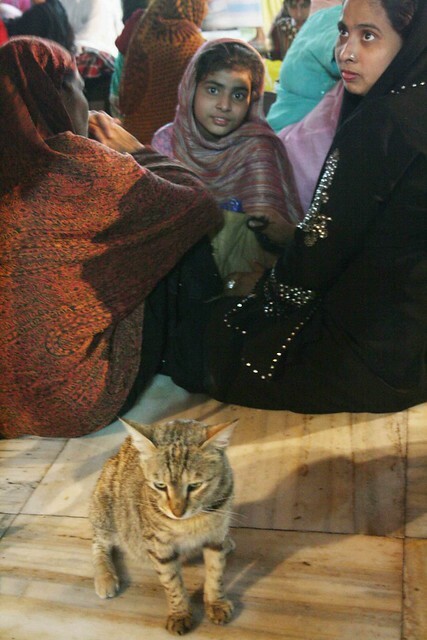 Billi is veryyyyyyy cute! But, dogs are cute too. Isn’t it strange that god created ‘unclean’ beings like the dog and the hog and then prohibited his overrated,biped , mammalian creations from associating with them? Another absurdity that religion makes you believe in. People shouldn’t look to the behavior-pattern of a seventh-century Arab-leader to lead the way. I love puppies and their wide,sparkly eyes. They look like little angels. Cuddly piglets ( ‘oinkies’) are made of bubblegum and strawberry and there is no reason one should ever hate them. wow your new delhiwalla looks cute Mayank. I saw a fat brown one there even cuter than this one!